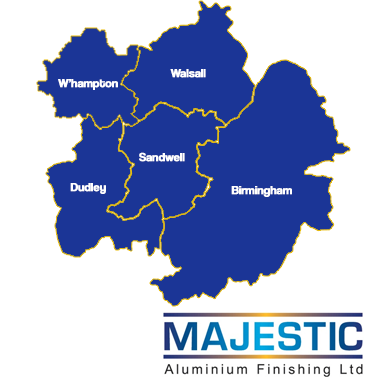 At Majestic, we realise the importance of the work we carry out on our customers parts and appreciate that time is on essence as we are the last in in the manufacturing process chain. We have therefore put together 3 levels of delivery service to help our customers meet their deadlines. Our guide to turn around times has been split between the various finishes we offer. *Please note that additional charges apply to Majestic Next Day and Majestic Same day services. *Please note that additional charges apply to Majestic Fast Track and Majestic Next Day services. Due to the nature of the finish and the details within the process, the delivery times on all the other services vary according to customer requirements and specification. Please feel free to contact us to discuss your requirements and we will be more than happy to advise you off approximate lead times. We also offer a collection and delivery service to all our customers within below catchment area. For all customers that fall outside this catchment area, a delivery and collection service can be agreed to suit everyone. Please feel free to contact us for more information.